Perhaps the most disappointing letter that I have seen in the past four weeks since beginning this work is one initiated by the City of Kingston’s Corporation Council Andrew Zweben – a public sector lawyer dated 10/24/14 -appears to be working against our Common Council’s memorializing resolution. Why? 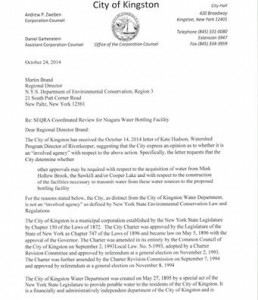 I received a copy of it last evening, and I’m assuming on behalf of Mayor Shayne Gallo, that the City of Kingston does not feel it should be a “Involved Agency” in the proposed water sale for the Niagara Water Bottling Proposal. Even after a recommendation to do so by the Kingston Conservation Advisory Council. And then, a letter from the prestigious advocacy group “Riverkeeper” for the same. After which, a memorializing resolution passing through the Council’s General Government/Public Safety Committee that will be voted on by the Common Council on November 4th to make it official. Or the hundreds upon hundreds of citizens who have shared their concerns since this project became public. Click on the image to view the letter in full. We support the Kingston Common Council passing through a memorializing resolution on November 4th that requests the City of Kingston to be listed as an ‘Involved’ Agency in the SEQR process. In doing so, you are acting on behalf of your public. There is enough evidence that our city along with the Water Board have an important role in all of this. DEC Declines Lead Agency Role. Requests the SEQR Action Expand Its Scope. We must not let companies come to small cities to pump their water sources dry-Bottled water is toxic and the companies that bottle the water including Pepsi, Coke, and Nestle will never tell the public about the breakdown of plastic that contains cancer causing including BPA. The majority of bottled water contains the same water you drink from your faucets. Only a few states have recycling of plastic water bottles and the majority end up in landfills and in our streams, lakes, rivers, and oceans.